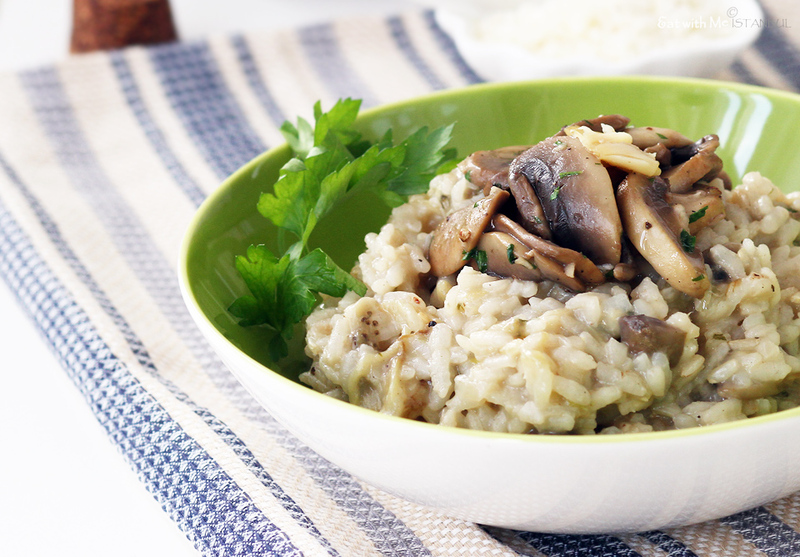 On a rainy evening, what can be better than a bowl of warm risotto? A warm lentil or pumpkin soup for lunch, and a risotto for dinner will set you right even if you’re not big on carbs like myself. The weather and the month December are two good excuses to indulge in dishes you don’t normally eat. And this risotto will be THE ONLY risotto I’ll be making repeatedly from now on, and I actually have made this three times already! Char-grilled eggplant puree, Patlıcan Salatası in Turkish, is my favourite meze and I can eat it every day ONLY IF grilling eggplants over the open fire was a less messy job, though it’s usually one of Mr.O’s jobs in the kitchen. Which version do you like the best? With yogurt, with tahini, or with olive oil, or with a bit of all? Do you have your own secret method of char-grilling eggplants? While I was looking for an idea, I came across two articles on the best way to char-grill eggplants. The first was to hit the eggplants 50 times, slit each lengthy way from one end to the other, wrap them in tin foil and grill in the oven. It sounds less messy. Why hitting? The skin will peel off more easily when cooked. What an excellent idea! How come haven’t I tried this? There are so many bakeries and pide shops in every street so I must try this next time. I’m sure they won’t even charge me here; I’ll give big smiles of appreciation instead. When I try it, I’ll let you know. It’s much better than buying eggplants and capsicums in jars for sure. 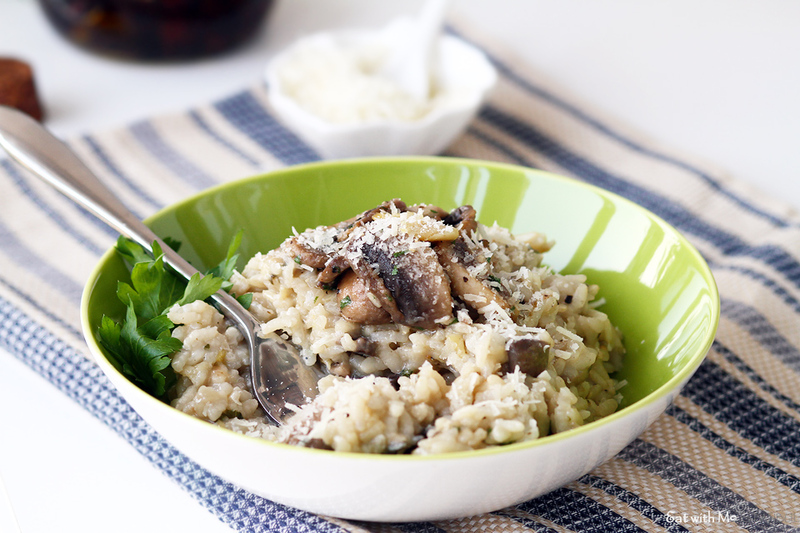 On a cold and lazy evening, I made this creamy eggplant risotto whose flavour was enhanced by the earthy mushrooms. 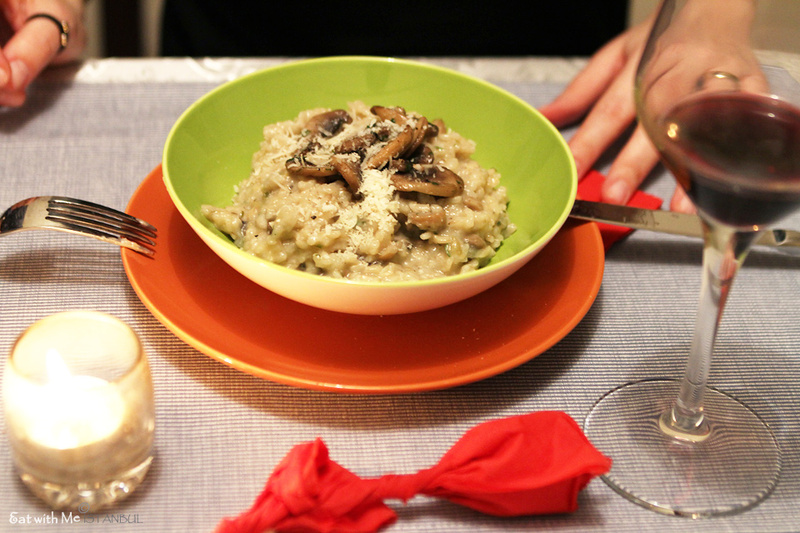 I’ve been eating the eggplant puree as a separate dish but combining it into a risotto proved to be pretty AWESOME. Now guess what? Char-grilled eggplant puree will be added to a must-have items in the fridge department, along with good home-made pesto and olive tapenade. My only regret is that I cooked this at night and the photos didn’t look as nice as it tasted. So I promised to myself to make it again, which I did just for photos – call me shallow! Don’t tell me that the nighttime spontaneous photos are better than the daytime ones! I just remembered a photographer saying that photography is a painting drawn by light. 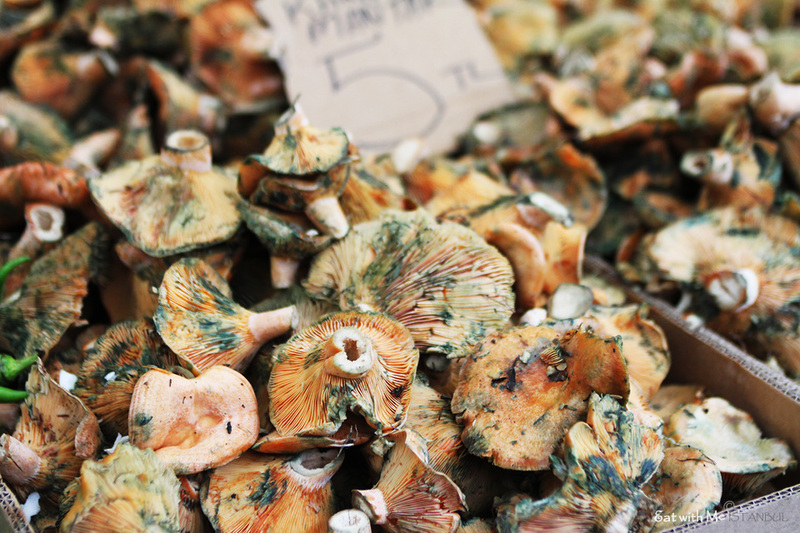 Actually, it’d have been nice to make this with Turkish wild mushrooms or chestnut mushrooms I saw at the market. This reminded me of the shock I had seeing the price of the mushrooms at that time. When tasting it, Mr.O said that it was a shame that only two of us were eating this delicious dish, so came the idea of the pop-up dinner with the most picky risotto eaters in Turkey. Anyway, it’s always nervous to cook for picky or critical palates, but I love challenges, love to eat reactions, love the emotional roller-coaster ride. You can call me crazy – my family have been calling me that since I was born whenever they caught me slitting and dance or making my entire room a maze with books. A super introvert, looking for an outlet, I suppose. I don’t agree that fancy dining and fine wines are only exclusive to the riches. 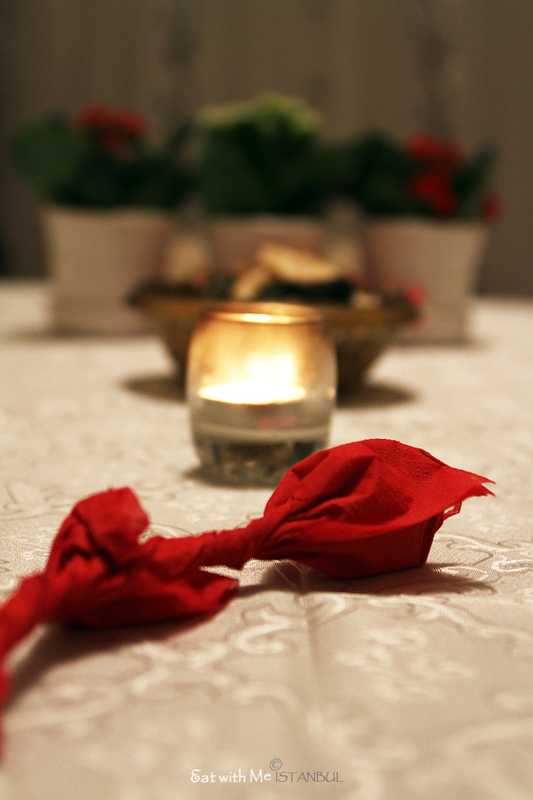 The guests arrived and we started off with a glass of red and a chat, and ‘T’ made a rose with the red napkin! Oh, the wine was good, too, and I’ll tell you more at the end of the post. The famous risotto arrived with Kohlrabi apple salad and I watched nervously the anticipated mouthful going into the mouth of the critic, ‘D’. There are many variations; some like dry al dante, some oozy, some creamy, etc. When it comes to cooking Italian, I’m more of the southern style, therefore, there is never cream in my risotto except for the French. Generally, the creaminess is created from the mixture of cheese, butter and starch itself. I don’t know what kind of risotto is her preference, but she says that she has sent back risotto in many restaurants, and goes on to say that she absolutely loved my risotto. Of course, how can it be bad? It’s made of home-made chicken stock, roasted garlic, nice Narince white wine and Tomme de Brebis, not Parmesan! You don’t know what that is???? Do you know Pecorino Sardo, then? Yes? Both are similar, made with raw sheep milk, sharp and tangy. Why didn’t I use Parmesan? I thought Parmesan would be a bit weak for such a smoky and earthy dish. So what wine did I pair this smoky dish with? I was going to buy my usual Turasan Kalecik Karasi because its light body accentuated with a supple acidity and the vanilla cacao undertone goes well with creamy and earthy dishes. But then I saw Syrah 2010, which just grabbed my attention for no reason probably because of the label. I have a good faith in Turasan as all their wines are pretty pleasant, the award winning Seneler CMS being exceptional, for example. Taking the chance, I also bought Turasan Merlot, which says it won a Gold medal in the 2014 Lyon International Wine Concours. So I look forward to tasting it soon, too. Good food and good laughters in the memory and a pretty paper rose on the empty table… Ah, and the pretty windowsill plant pots as a gift. I’ll need to do this kind of pop-up dinners more often but we shall see how. 3-4 handfuls of wild mushrooms, shiitake, chestnut mushrooms, etc. For the how-to, please check the previous recipe, Wild Rice Risotto with Wild Mushrooms, and make sure you pour the stock one scoop at a time.